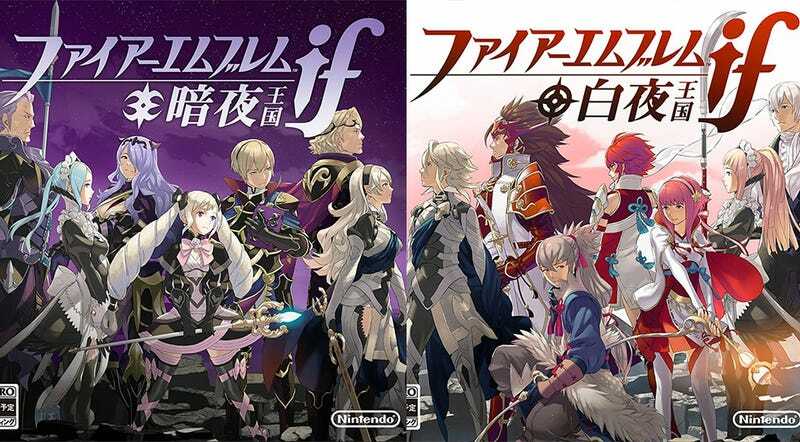 There are three versions of the newest Fire Emblem title: Fire Emblem Fates. Yet, it’s not just the plot that changes between each version, but the gameplay as well. To start, let’s take a look at the differences between Conquest and Birthright—and leave the DLC version of the game, Invisible Kingdom, for later. Of course, the most obvious difference between the two main versions is the party members you play with. There are 15 main characters that appear in both versions of the game with an additional 26 appearing exclusive to Conquest and 27 exclusive to Birthright. Among these characters, several have a job class specific to them—and thus their version of the game. In between battles, your characters hang out at your castle. Not only do the castles look different in these two versions of the game, they also produce different resources. Of course, you can always gather the materials you don’t normally have by visiting someone else’s castle via street pass. Battle is handled differently as well between the two versions. In Birthright, the objectives are almost exclusively “kill all enemies” or “defeat the enemy general.” In Conquest, the objectives are more complex, tasking you to catch enemies, win within a time limit, defend a point or location, or break through enemy lines—in addition to the standard kill-everybody/defeat-the-enemy general missions. However, the largest difference between the versions is that while Birthright allows you to replay missions (with slight changes to the enemy’s composition)—and in turn level up/gain money whenever you want—Conquest does not. In Conquest, you are relegated to the 28 story missions, the castle defense missions, and any paralogues you are able to unlock. Because of this finite amount of money/exp, it’s doubly important to pick the best possible team and kill every enemy you can as there is no way to go back for anything you may have missed. To end with, let’s look at the DLC version of the game, Invisible Kingdom. Invisible Kingdom is an amalgamation of Conquest and Birthright when it comes to the gameplay. You are able to recruit 67 of Fates’ 68 main characters along with an additional character only available in Invisible Kingdom—this in turn allows an opportunity for both homosexual relationships. As in Conquest, the mission objectives have a similar variety and, like in Birthright, you are able to replay missions to farm exp and gold. Now the only question is, which version will you buy when Fire Emblem Fates comes west next year? Fire Emblem Fates was released for the Nintendo 3DS in Japan on June 25, 2015. It will be released in the US sometime in 2016.